A few years ago, my husband called me from work with a question that changed our lives: “Can we keep him?” Long story short, the “him” in question was a three-year-old Maltese-x. No longer wanted, his owner bought a much larger dog thinking it could handle the wayward hands of unruly children better than this 5 lb. scrap of white fluff. Sight unseen, I said yes and made a friend for life. His first night he was so terrified, he wouldn’t leave my side. He refused to make eye contact and licked his lips repeatedly — dog language for “I’m super stressed. Please don’t hurt me. I promise I won’t hurt you.” I just sat quietly and let him get used to his forever home — one with guaranteed security for the rest of his life. Morty, safe and happy in his new home. Photo by Krista. It’s amazing what people will cast off. Morty is friendly, energetic, and loyal. He wants nothing more than to hang out at your side. 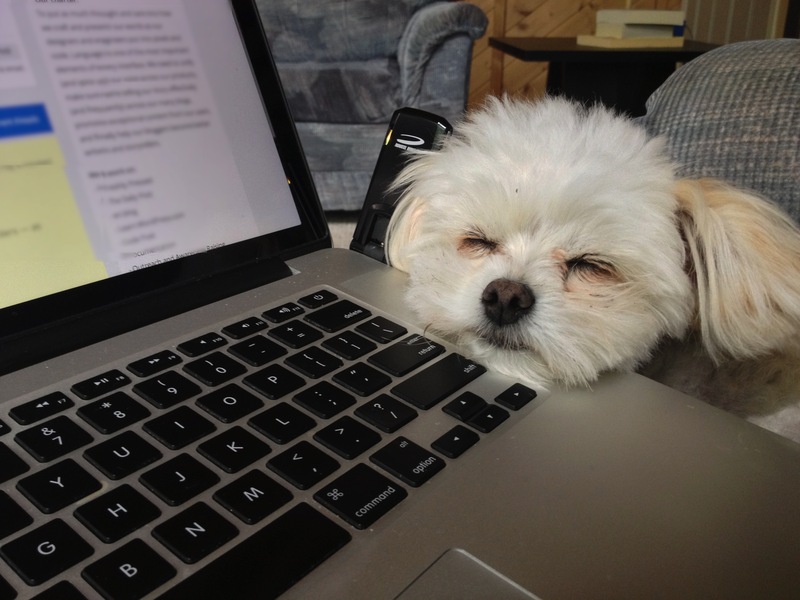 One of his favorite things to do is rest his snoozy mug on my laptop as I work. Every time I look at this photo, I think he’s smiling. For this week’s challenge, show us something that represents security. It could be your kids happily reading under their favorite throw blanket. It could be a roaring fire chasing away the last of winter’s cold. It could be a worry stone you keep in your pocket or that favorite tee shirt that makes you feel awesome every time you put it on. Looking forward to seeing your creative interpretations of this theme! Such a cute picture Krista! It’s wonderful that you two were there to provide a home. It always breaks my heart to think of a dog that is unwanted. What a wonderful story. I get so sad/angry when I hear about people returning pets. Hearing stories like this where they go on to find their forever home with a loving, caring family helps me feel like all is not lost. There are still some good people out there. Thank you for sharing. He’s such a little cuddle bug and a great friend. That’s the amazing thing about him — what we offer him in a loving home is nothing compared to the unconditional love he gives us. It is amazing what others will do to just get rid of something because they no longer want the responsibility. Looks like he is smiling, sign of contentment. Less than a year ago I took a rescue dog too.. best decision ever, he made my life so much brighter! Your image make me feel safe too … lovely image. Hallo. I have tried to make a pingback, but it does not show. Its about 1 hour ago. Its my first so maybe i do it wrong? It may be because the page was trashed at one time? You may need to update the page to refire the pingback. In any event, I see that you’ve left a follow-up comment to share the link, so that works too — people will be able to find your submission. such a warm story. he is one lucky guy. I did the same thing as your wife. I texted my husband one day while he was at work because I rescued an 8 year old chihuahua from the animal shelter. He was super nervous the first few days and grew to love us over his last few months of life. Poor little sweet dog has passed away now and I miss him. I am sorry for your loss! So great that you gave a senior dog his forever home — so many are overlooked for puppies. Here’s my entry for this week’s challenge. Welcome back! Krista, your dog looks like mine especially after its haircut. OH MY GOODNESS. That is some serious cuteness right there. Adorable! 469 Responses While this challenge is closed to new entries, we encourage you to visit the Reader to find other avid bloggers. Weekly Photo Challenge: The Security in Painting – Pain(t)h.D. Image Coffee Grey Longteng Bridge, Miaoli County, Taiwan. Do What You Wish Love, locked. TINY LESSONS BLOG Travels. And Homecoming Gifts. Travel. Explore. Sparkle. Shine. Weekly Photo Challenge – Security – Forts! lifelessons – a blog by Judy Dykstra-Brown Security is . . . Ouch!! My back hurts!! Security! Übersetzen und Literatur, doch nicht nur Security? It’s an Illusion. Lost in Translation BELLA CIAO! sonja benskin mesher . this security thing . THE PETALUMA SPECTATOR PHOTO BLOG Security of a Toilet? SERENDIPITY SECURITY OR NOT? DON’T CHOOSE.